***See FergusonResponseNetwork &/or FergusonAction ACTIONS for updated, ongoing listing. For exciting, empowering Reports on actions: PPA FB Event, & PPA FB, FergusonAction. Also see for NewYorkCity & Baltimore. ***FLASH: Thurs AM: Protesters disrupting NYC Macy’s Parade; arrests happening. ***NYC Special “What’s Next” Strategy Session: Sat, Dec 6, Solidarity Center, NYC: FB Event. Please keep use posted of any actions taken in your area: Email: info@peoplespowerassemblies.org, or use PPAContact Form. 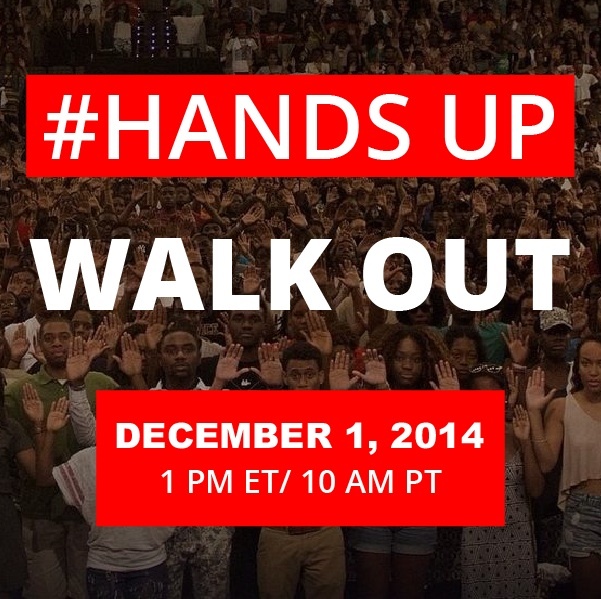 -MONDAY: Dec 1: Mass Walkout #HandsUpWalkOut: Support a mass walk out from work & school starting at 12 PM. (The time Michael Brown was murdered.) Get an image to share. 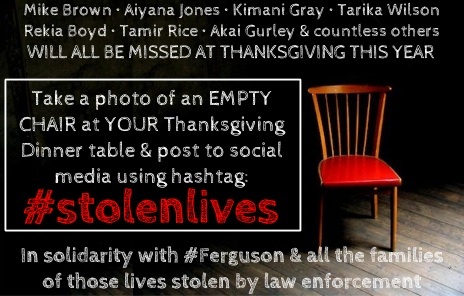 -THURSDAY Nov 27, 2014: #StolenLives: Leave an empty chair & table setting for those who have been stolen by state-sanctioned violence. Take & share a photo on social media using #StolenLives. See details. 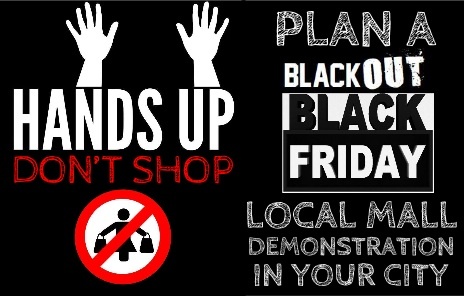 -FRIDAY, Nov 28: #BlackFridayBlackout: See actions called (inter)nationally to economically boycott/disrupt & draw media attention to the Ferguson Case on the largest shopping day of the year. Esp in NYC 1pm Macy’s flagship store in Herald’s Square. Add actions: Email: info@peoplespowerassemblies.org, or use PPAContact Form or FergusonNationalResponseNetwork. -SATURDAY, Nov 29: Mass Action #NoWords: Call an action in your city. Make it clear the militant, inspiring outpouring of outrage this week was not just a passing moment. Use picket lines & community speak outs. Read the names of other unarmed Black people killed by the state. Take 4.5 minutes of silence representing the four & one half HOURS Mike Brown’s body lay in the street.